Then one day, my husband declared that he was going to start running marathons. Pasta became his favorite way to carbo-load, at least twice a week. And that’s when we decided to give the whole-wheat stuff another go. There was, it turns out, a lot to choose from. In the last few years, the whole-grain pasta offerings on supermarket shelves have expanded with gusto. Where there used to be one or two, there were now up to a dozen. There’s everything from mass-market brands touting health claims (High fiber! Good source of omega-3’s and antioxidants! Extra protein! ), to artisanal pastas made from ancient strains of wheat like farro and spelt in tastefully rustic packaging, selling for upward of $10 a pound. Ken Skovron, co-owner of Darien Cheese and Fine Foods, a specialty store in Connecticut, said that in the last few years he has watched sales of whole-grain pastas soar. Unlike the gluey, good-for-you-but-not-your-tastebuds pastas of yore, the best whole-grain brands are firm-textured and tasty. I like the toastiness of whole-wheat spaghetti from Garofalo, which Emma Hearst, the chef and a co-owner at Sorella in Manhattan, compared to Grape-Nuts when we tasted it together. The gentle, honey-like flavor of Gia Russa whole-wheat fettuccine makes it a perfect “kid pasta,” said Anna Klinger, chef and co-owner at Al di Là in Park Slope, Brooklyn. My favorite is Bionaturae, which has a mild, clean flavor and an elastic texture that comes closest to that of regular pasta. The warm, nutty flavor of varieties like these is robust enough to stand up to intense, complicated sauces, yet satisfying with just a little butter and Parmesan shaved over the top. Some were so good that I would happily eat them for their own toasty sake, even if their high fiber and nutrient count had not been lingering in the back of my mind. According to Lidia Bastianich, co-owner of Felidia restaurant and of the new Italian-food megaplex, Eataly, with growing numbers of people trying to eat more healthfully, the demand for higher quality whole-grain pastas has gone up. Manufacturers big and small are working hard to create products with the springy texture and sweet flavor that once was obtained only through refined flour. For the most part, Ms. Bastianich said, they are succeeding. Eataly makes fresh whole-wheat and farro pasta daily, and carries nine shapes of dried whole-grain pasta, including Garofalo’s fusilli and Alce Nero’s farro penne. She says she enjoys eating whole-wheat pasta at home. “There are times when I prefer something less starchy and more nutritious, but I also like its nutty, grainy flavor,” Ms. Bastianich said. She suggests pairing whole-wheat pasta with heartier pestos, like one made with spinach and walnuts. Anchovies and bread crumbs also go nicely with full-flavored whole grains, she said, as do wilted greens. To that list, I would add spicy tomato sauces, meat sauces, and chunky vegetable sauces with plenty of garlic. Delicate cream sauces, however, tend to come up short. Ms. Bastianich and others said that whole-grain pastas have improved because some manufacturers are seeking out higher-quality wheat. White pasta is more forgiving. Pretty much any high-protein flour will produce an edible linguine, though durum wheat (including semolina) is considered the ideal. Not so with whole wheat, which must be made with low-yielding wheat varieties for it to have any kind of textural integrity. Low-yielding durum wheat works well; it is used to make Bionaturae and Rustichella d’Abruzzo, another tasty brand. Even better are some ancient strains of wheat, including farro, spelt and the little-known einkorn, one of the oldest wheat varieties known to humans. The reason these grains make good pasta, said Andrea Brondolini, an ancient-wheat specialist at the Italian Agricultural Research Council in Sant’Angelo Lodigiano, can be traced to the early history of agriculture. As ancient types of wheat were hybridized into modern varieties, they were bred for a higher yield. “Higher yields are detrimental to the quality because when you improve the yield, you lose nutritional values, including iron, carotenoids, vitamin E, microelements and proteins,” Mr. Brondolini said in a telephone interview. Ancient grains are less hybridized and therefore retain more nutrients and proteins, he explained, including glutens that help pasta hold together when it’s cooked and give it a firm bite. The first pastas ever boiled to al dente perfection were made from whole-grain flour, according to Oretta Zanini De Vita, author of the “Encyclopedia of Pasta.” They must have been good, or pasta would have gone the way of garum and gruel instead of evolving into one of the most beloved foods on the planet. Of course, pasta made from 9,000-year-old varieties of wheat isn’t necessarily easy to track down at your local supermarket. Most common whole-grain brands are made from standard high-yielding strains fortified with extras like flaxseed, oat bran or legume powder for added dietary oomph. He particularly likes it in a rich wintertime sauce made from cabbage, sausage and plenty of cheese, preferably served with an old Barolo from a friend’s cellar. “No one would ever call that health food,” he said. We could say that Garofalo Pasta was born in 1789, when by Royal Decree, Mr. Garofalo obtained the concession for the production and sales of a “well-made pasta,” and the right to fine any violators of this enterprise. We could talk at length about when, in the early 1900s, shortly after the construction of the second manufacturing plant, the Garofalo brothers decided to divide the firm and founded Lucio Garofalo Inc and Alfonso Garofalo Inc, providing two possible paths for the development of a company started two centuries earlier. We could boast of the fact that in the 1920s in Italy, Garofalo Pasta had become pasta quality par excellence, so that Dottor Garofalo proudly claimed that books and magazines referred to “high- quality Pasta, as Garofalo-type”. We could move you with stories like that of Lucia , the Somali housekeeper of the Garofalo house, that “invested” her savings in pasta to send back to Africa, a continent in which, by then, the Garofalo Santa Lucia brand had become synonymous with pasta, both in taste and in the colors of the pack, red and blue. We could even list all the certificates that, from the first pasta factory certified ISO 9001, we have accumulated over time or all of the technologies that were used in our plants to transform the best semolina into the best possible pasta. In fact, we like to think that the story of Garofalo Pasta is all in the pasta that we produce, in the knowledge and in the constant search of quality and taste that everyone, from the workers to the CEO, contribute to a project that continues to survive generation after generation. And that’s Garofalo Pasta today! 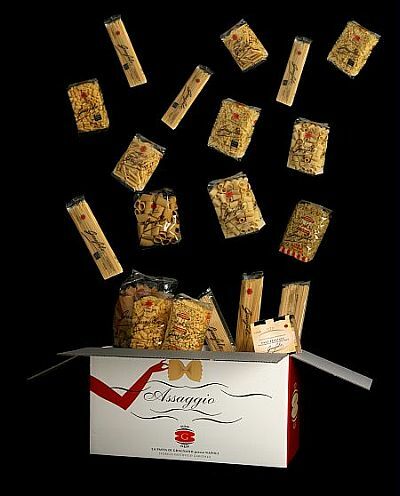 Furthermore, the new pasta line that launched in 2002 is wrapped in transparent packaging. The packaging is as transparent as our belief that knowing how to make outstanding pasta is an ancient art with its own code of rules. It is the result of an understanding that has been passed from generation to generation and can be tasted in every package of Garofalo Pasta that you eat.